Dance should be categorized as an EXTREME sport. The injuries are often complex and involve multiple linked areas within the body. Being the father of a preteen dancer and a doctor who has helped many highly competitive children and young adults, I learned years ago that keeping the dancer going requires far greater than the ordinary level of care. The approach must address the whole body with a unique integration of techniques. What are the common injuries seen in dancers? Years ago, I would’ve said most injuries in dancers are in the back, hips, knees, ankles and feet (and toes—lots of toes). More recently, with the popularity of Acro Dance and Contortion, neck injuries are more prevalent (often presenting as a headache). Most of the dancers I see participate in numerous styles of dance, making every part of the body subject to damage. It could be a temporomandibular joint (jaw) or neck issue from a chin stand, ankle from a landing, a wrist from a lift, or the spine and pelvis from everything else. What’s the best and quickest way to solve dance injuries? I have found that a dancer’s injuries are rarely isolated to a single body region or spot. This was evidenced by a teenage ballerina that came to see me for an ongoing ankle issue that threatened her ability to dance. Her ankle was indeed part of the injury, but her problems involved far more. Although not painful, her knee and pelvis showed signs of dysfunction when tested. Addressing all three areas brought improvement, but her condition was like a puzzle with many pieces. She required work on every joint from her toes to her lower back. Using an instrument (as pictured), I made gentle adjustments to each region to bring correct alignment and movement back to all joints involved. This method is not only effective, but typically feels good to receive. 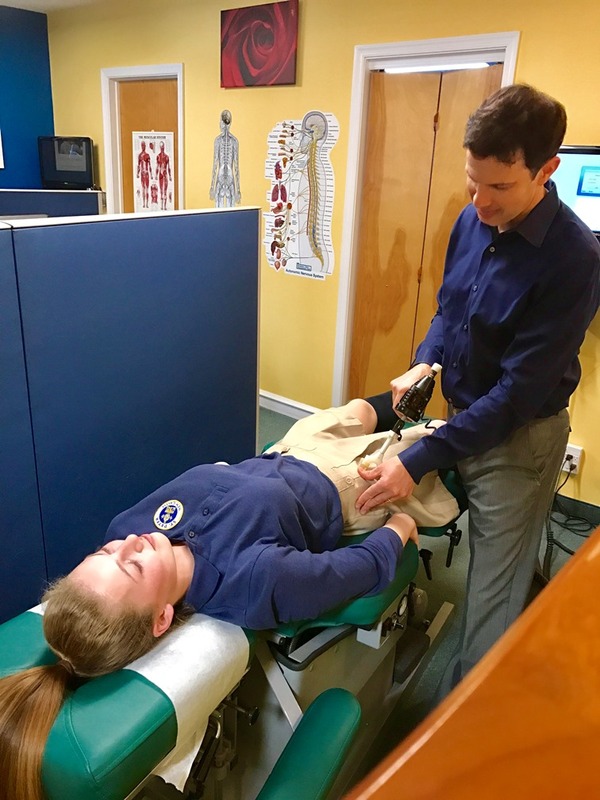 After finding twisting in the myofascia (dense, tough tissue which surrounds and covers all of your muscles and bones) from her foot all the way to her pelvis, I used a percussing instrument (a doctor-grade, hand-held massage device) to release the twisting and restore balance. After a period of visits, her chronic ankle pain and dysfunction resolved. In more recent years, I have added cold laser therapy to help injured tissue heal faster, lower inflammation and reduce pain. Additionally, I use the laser to help restore strength to weakened muscles. This nerve and muscle technique (used with Olympians and professional athletes) can make a tremendous impact by shortening the time it takes to get a dancer dancing again—or keeping them dancing while they are going through a course of care. All of you dance moms and dads out there likely know the answer. The incredible grit of these young women and men are rivaled by none. They persevere through pain and want nothing more than to continue to do what they love—dance! I have found the greatest concern a dancer has when she sees me is that I will pull her out of dance. This is always a possibility and at times absolutely necessary. BUT, I have found that by addressing the body as a globally integrated system (all parts working together and interconnected), dancers have the best opportunity to recover while still dancing. This is especially important considering an upcoming competition or recital. You may think that injuries occur when something wrong happens, such as a bad landing, fall, slip, or collision. Contrary to this belief, the majority of dancers do not report a specific incident. Injuries appear without warning or slowly creep up. Think of a process rather than an event. The majority of issues arise from uncorrected imbalances caused by day-to-day wear and tear. Often no symptoms exist or the dancer may only feel tightness or notice that one side is more flexible. I have found that many injuries can be avoided by having dancers come in periodically for tune-ups. After all, a balanced body can withstand far more. It also helps dancers perform at their best (which can make a huge difference in a judge’s eyes). Taking drugs to mask symptoms reminds me of a joke I once heard. A comedian was complaining because his muffler just fell off of his car. He stated with despair, “Now I have to go out and spend a ton of money on a louder stereo.” Failing to address the underlying problem puts a dancer at the greatest risk of worsening her injury and no longer being able to dance. Please consider that even if a drug is used, the condition still needs to be addressed. The symptom is a form of communication (an alarm) and is not the problem. The problem is the problem! What concerns me the most is how ignoring the injury (by taking drugs or just putting up with it), allows the condition to persist. This goes for dancers as well as any young athlete, and can be a mistake with life-long consequences—especially considering that the dancer may still be growing. Many adults tell me in their initial histories that their conditions started when they had a sport or dance-related injury in childhood. Left uncorrected, the injury often worsens and may lead to permanent impairment. When hearing this history, I am always left wishing that someone told their parents to take them to a chiropractor when they were kids. Dance is beautiful, expressive and meaningful. The seemingly effortless and graceful movement and ultimate defiance of gravity can cause dance moms and dads to overlook the impact on their dancer’s body. With specific chiropractic tune-ups, many injuries can be avoided while the level of performance is enhanced. If an injury does occur, the right approach and understanding can best solve the problem and provide the dancer with the greatest opportunity to keep dancing and help provide the best possible future.